In the picture above, which captures a scene from Barcelona's 3-1 victory over Atlético Madrid last night, you can see Barcelona's entire season. 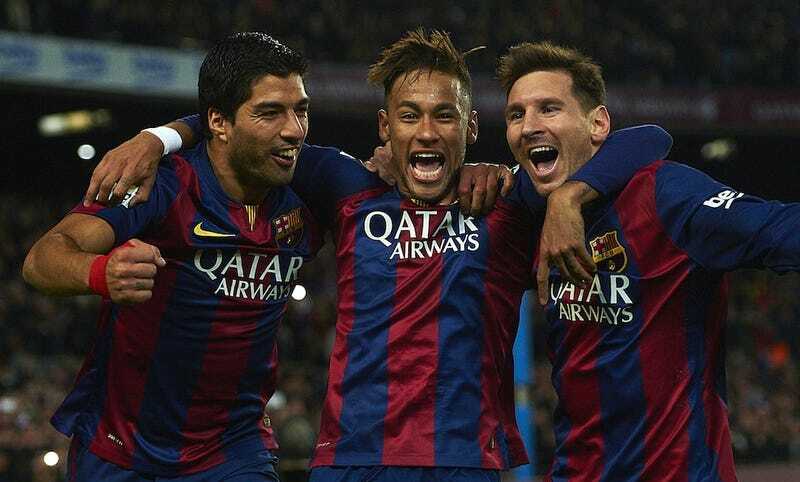 It shows Luis Suárez, Neymar, and Lionel Messi—the three players whose individual brilliance has kept the team in the hunt for all the major trophies despite the turmoil surrounding the club that has threatened to ruin everything. Up until yesterday, the three hadn't yet put together the collective performance against quality opposition we all expected to see this season. But in those smiles, in their sheer joy at being together and playing together, we see the hope for what still can, when every thing comes together just right, be a truly great team. It was the second consecutive match—the first being a 5-0 throttling of little ol' Elche in the Copa del Rey—when the Big Three all managed to get on the score sheet together. Individually, these are three of the most potent goal-scoring forces anywhere in the world, but even more critical than their ability and desire to find the back of the net has been their selflessness. Each is just as happy to play the final ball for one of their partners to tap home or make a sacrificial run to free space as he is to take a crack of his own. The willingness to share, when shown by the best players on the team, sets the tone of team over individual for the rest of the squad. At one point early on, for instance, Messi found his way into the box and decided to shoot rather than play a pass out to an unmarked Neymar. After his shot missed the target, he immediately lifted his hand to the kid to apologize. The most fearsome goal scorer of the past half decade—maybe ever—recognized that even an attempt on goal coming off one of his boots in a dangerous position was the wrong decision when he could've tried passing to the boy wonder out to his left. Messi, Suárez, and Neymar all know that for this setup to work, they need to focus on creating the best chances rather than on who makes the final touch. If the connection becomes a good as it can, there will be plenty to go around for everyone. The Atlético match was Barça's best performance of the season precisely because it was the most integrated the front three looked with each other and in the greater scheme. It was still reliant on magic from each of the forwards, yes, which as we've seen thus far isn't the most sustainable of strategies, but there are reasons to believe this might be a turning point. In many ways, any one of last season's six matches between these two sides, in which Atlético went unbeaten, has served as the blueprint for how to stop Barcelona. (You could argue the blueprint was laid out back when Bayern steamrolled them in the Champions League semifinal, but a game plan of having an inordinate number of the biggest, fastest, most technically gifted players anywhere who proceed to trample Barça's little guys isn't a viable strategy for many other clubs to emulate.) Atléti pressed tirelessly in well-regimented, absurdly compact and narrow waves, and tried immediate counters down the flanks when they regained possession. To combat this, Luis Enrique—hey, not quite the idiot he was last weekend, now is he?—had Neymar and especially Messi, the two wide forwards, play much closer to the touchlines than he'd asked them to previously. Coupled with more central involvement from the midfielders and combination play with the slightly less adventurous full backs, Barcelona were able to dominate play out wide, which forced tight and compact Atlético to venture out further than they'd like. This opened space through the middle, and when you give space to forwards of MSN's quality of passing, movement, and dribbling skills, you're dead. The second was another carefully coordinated move from the forwards. As Messi carried the ball from the inside-right channel into the heart of the defense, Neymar, out ahead and wide left, decided to make an offside run across the face of the box. The backtracking defenders had to account for the possibility of Neymar getting back on side to Messi's right for an easy finish, which caused them drift towards his direction. This opened up space for Suárez to flare out further leftward. Messi bisected a couple defenders with a pass sent right through the lane created by Neymar's run, and Suárez's little hopping side-footed shot doubled Barça's lead. Goal number three was the crucial one that staved off Atléti's second half fightback. During the first 45 minutes, the Rojiblancos sat deep, inviting Barcelona into their half before unleashing the pressure. Sitting that deep though meant Barcelona's players could fairly easily find an outlet when under pressure and, if dispossessed, the collective had time to win the ball back high up the pitch before Atlético could start a counter of their own. Down two and chasing the game, Atléti started the second with a much more frenetic pressing style that spanned the entire length of the pitch. After a first half where they were completely dominated, this adjustment got them back into the match, and a Mario Mandžukić penalty in the 57th minute gave the visitors hope of taking at least a point. Instead of capitulating, Barcelona fought on. A few minutes before injury time, Barcelona regained possession and sparked an immediate counter. Andrés Iniesta floated a pass out on the left wing to Suárez, who had interchanged positions with Neymar. The midfielder's first ball caught out Atlético's defense, and played Suárez into acres of space with no full back to charge him down. After dribbling the ball forward with his head up, Suárez measured a perfect cross-field pass out to Messi on the opposite wing. After collecting the ball, Messi played a one-two with Rakitić, which didn't reach Messi's diving attempt but did carom off an Atlético defender's leg and back into the Argentine's path for him to tap in. (By the way, Rakitić was finally used in a more advanced role suiting his attacking gifts, complemented by a more deep-lying Iniesta, which resulted in both players' best match in some time.) The third goal with only minutes to play gave Barça their three points, and had the three most pivotal players wheeling off towards the fans, arm in arm, finally performing in the big matches the way they all assumed would be the norm when they joined forces. As is always most important at Barcelona, it wasn't just that the team managed to defeat the reigning La Liga champions and Champions League runners-up—it was the how that was most promising. The well-spaced, coordinated forward play, the integrated midfield that combined the defensive solidity they've displayed all season with an attacking impetus they've so obviously lacked (it was crazy how surprising it was to see Barcelona midfielders getting between the lines to pry apart the defense), the presumably preferred back line playing just as assuredly in the center but a little more cautiously out wide—it wasn't a lucky result that papered over the cracks. There were fundamental reasons why Barça came out on top and looked so good doing it. Messi might still hate Enrique, and the coach's job security might still be as tenuous as it was early last week, and Barcelona might still be overly reliant on Messi, Suárez, and Neymar to produce all the key moments, but none of that mattered yesterday. For 90 minutes, in the biggest crucible many in the club had ever been forced to endure, the entire team, from coaches to players, put on their best showing. While there had been glimpses before of what this team in peak performance could achieve, this was the closest realization of it yet. Now to see if they can keep it up.